I have learned to stretch as part of my routine at the gym. I fought it at first, not liking the tight, sort of creaking, tough feel to my limbs and joints. I finally discarded some of the stretches that took real strength to hold, and that helped. I resisted less. Over time I started to enjoy it. It really did feel good to reach and stretch and bend and stretch, as I was told it would. It lessened the soreness the next day too. 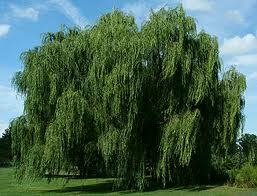 I don’t exactly sway free like a willow tree, but I am surely more limber. Are there applications to life in that? Brain limber… acceptance… limber emotions. Hmmm. There is something lazy and and easy and lovely about its shape, about the elegant way the branches reach up and then arc over and down to sway, lace-covered, in the slightest breath of wind. There is something magical about the hiding place inside, nearer the trunk, through the branches that almost gently kiss the ground. The daylight is more green underneath. The sense of invisibility, of safety, is far stronger than logic would predict, since of course someone could look through that lace and see what is hiding beneath. If I were to reach up, as tall as I could stretch, and grasp one of those lacy branches nearer the top of the arc, and pull downward… that branch would not break. It would bend down, allow itself to be pulled, to be stretched as far as my strength could hold… but it would not crack. The branches are green and supple inside, not necessarily young — a willow tree for all its delicacy does not strike me as impetuously young — but yes, limber. And if I were to pull and pull, with my whole weight, until that limb was holding me up against gravity, against the pull of the earth, would it (could it?) then lift me up, fling me up tumbling into the sky? Weeping willow tree as trampoline? Or bungee cord? Or would I give in and give up flight and let go the branch, and would it simply rise back up, shrug a bit and then settle back into place, with a few pieces of lace shaken off to float shimmering down? The sun has moved farther toward the horizon as I’ve pondered. 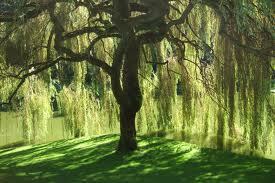 The green beneath the not-young willow tree darkens. The safe gentle bright afternoon feel slips away and instead there may be slithering things in a space that is no longer a fort but a cave. The light from the kitchen window is now what beckons warmly. It is time to leave Old Man Willow to his dreams, and perhaps return tomorrow at midday to see that he is, in fact, just a tree at water’s edge with trunk and roots and a gentle daytime heart. And, so, what about life applications? To me, “Limber” says fearless, easy, flexible, sanguine, accepting, go-with-the-flow, think on your feet, be open to surprises, creative, loose. In many ways those things, all, elude me. Perhaps they are awaiting me up in the air above the willow tree, if I only have the courage to let that tree limb lift me up. Or — no — perhaps they are prizes to be won by braving the dark cave underneath the tree some night. Or perhaps they are all in me more than I realize, and I just need to sit, still for a while, and sway back and forth gently along with the willow branches in the summer breeze. 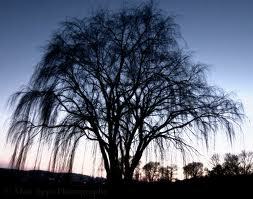 This entry was posted in Uncategorized and tagged limber, nature, perspective, trees, willow. Bookmark the permalink. Pulling the limb down, it could not take your weight and throw you up, up into the air, Wile E Coyote style, but- if you pulled it down as hard as you could and then Leapt, it would assist your leap, and you could leap higher than ever before.